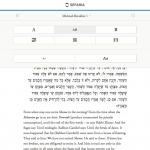 Sefaria is a free culture project devoted to bringing the textual tradition of Jewish learning into a new, flexible, open form in order to make texts and learning more accessible to more people. Modeling values in the tradition itself, the architecture of Sefaria emphasizes interconnections between texts and a polyvocal willingness to co-present multiple texts at once. As of November 2017, Sefaria’s library includes 135 million words of texts and 1.5 million interconnections between texts in the library. 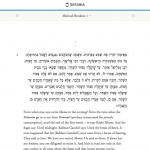 Sefaria’s library is designed to hold multiple versions and translations of every text, and ensures segmentation and structure allow for alignment between texts and translations. 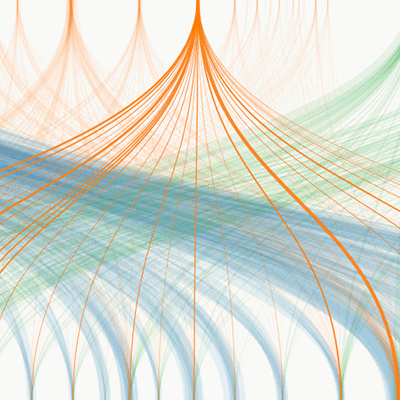 Sefaria’s approach to structuring texts and connections as data allows it to power various visualizations and applications. 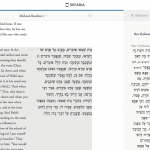 Sefaria exports its data with Creative Commons licenses which allow for reuse, allows developers to download a dump of their databases, and offers free APIs to support novel applications related to Torah texts that can be developed independently of Sefaria. Sefaria actively scans new texts and fundraises to pay publishers to release their copyrighted translations with CC licenses. The largest project of this kind to date is the release of the newest complete translation of the Babylonian Talmud (the Steinsaltz translation into English and modern Hebrew) with a CC license, the first time a complete English Talmud had been made available for free. Sefaria also offers tools for users to engage with and create from texts in their library, primarily via their Source Sheet Builder. A source sheet is a staple of the Jewish educational method in which an educator creates a document with selections from various primary sources relevant to the topic the educator is teaching. The first application built on top of Sefaria’s API, Sefaria’s Source Sheet Builder makes the process of building source sheets easier for educators. It has been used to create more than 100K source sheets to date. Sheets on Sefaria can also include user-generated text, sources outside the Sefaria library, images and videos. In addition to offering a platform for publishing and sharing sheets, there is a second structured dataset which captures human curated data about the relationship of texts to one another and to the tags that users assign. 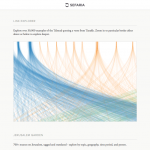 This dataset allows Sefaria to create a ranked index of all topics currently of interest to Jewish educators, as well as offering data-driven answer to questions like, “Which source in our library is most relevant to X?”. In 2013, best-selling author Joshua Foer and former Google product manager Brett Lockspeiser created Sefaria in response to a unique problem and opportunity: The Jewish world was failing to take advantage of major technological developments that could yield unprecedented opportunities for learning. Josh and Brett envisioned a tool that would lower the barriers for engagement with Jewish texts, create interactive interfaces for novel Jewish conversation and commentary, and provide educators, scholars, and technologists with an open-source database of texts to make new educational applications easier to develop. Sefaria is a non-profit organization funded by grants and donations, with a distributed team across eight locations in North America and Israel.